Greece will use its presence in various European institutions to promote dialogue between Russia and EU countries, Greek PM Alexis Tsipras said after meeting Russian President Vladimir Putin on Wednesday. Dialogue on a range of European issues, including security in the region, is not possible without Russia, Tsipras added. "There is a direct necessity to return to a serious dialogue on a new architecture of security, strengthening the role of the OSCE [Organization for Security and Cooperation in Europe] with the help of this dialogue," Tsipras said at the press conference in Moscow. 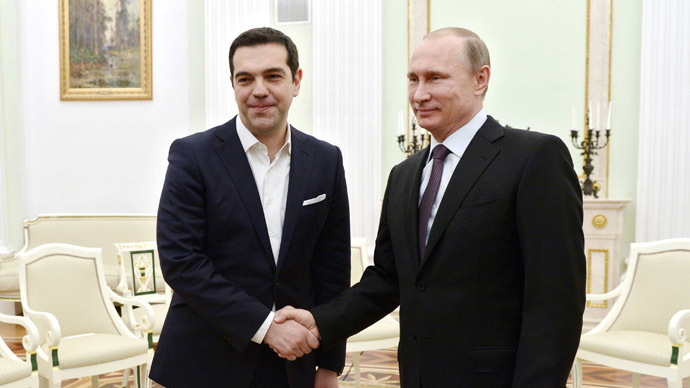 Putin said he discussed the future of relations between Russia and the European Union with the Greek prime minister. "We've exchanged opinions on the prospects for Russia-EU relations," he told a press conference. "Long-term and strategic cooperation" with Europe has always been on Russia's agenda, so "there is nothing new or unusual" in Tsipras's actions in this direction, Putin said, expressing his support for the Greek's PM’s plans. Compliance with the Minsk agreements on solving the crisis in eastern Ukraine is "the key to overcoming the deepest European crisis," the Greek prime minister said, adding that sanctions only drive nations further apart. "Dozens of thousands of Ukrainians, who are ethnically Greek, and live in [the Ukrainian city of] Mariupol and nearby areas" are also at risk if the conflict continues, Tsipras said, expressing his support for the Minsk agreements. Speaking after the meeting with Tsipras, Putin also stressed that Athens has not formally asked Moscow for financial help to pay off its debt.“The Greek side did not contact us with any requests for help,” the Russian president said, when asked by a journalist whether Russia could help Greece with its debt burden. Commenting on some negative Western reactions to his Moscow trip, Tsipras said: "Greece is a sovereign country with its unconditional right to conduct a multifaceted foreign policy." The country can use its political role as a "European, Mediterranean and a Balkan state" as it sees fit, he said. The two leaders also discussed Victory Day celebrations later this year, when the 70th anniversary of the end of World War II will be marked. Both Russia and Greece give great importance to the anniversary of the end of the war, in which "people of our countries fought shoulder to shoulder," Putin said Wednesday. It has been previously reported that Tsipras intends to attend the Moscow commemorations.